I often here, "harder than I thought" / "not enough business"
"I am not happy that I can not get the 360's from the Camera. I think that Matterport goes down the road to be obsolete with there close up policies. Just look at other companies that don't exist anymore or slowly diminish because of the same backward thinking." "You might have a few REALTORS that don't care but photographers they should. I lost 2 jobs in the last 4 month because of it. The Theta S has horribly unacceptable quality for bigger businesses. I could have competed with the 360's from the Matterport Camera." "I don't want to be stuck with a expensive paperweight in one point. I know that the doghouse view is a cool feature but doesn't make me money as I scan mainly businesses and I can create a 3D floor plan if I would need to." "I don't like to be shackled!" I think those points are certainly valid, but imo not a reason to get rid of your camera. @Jamie I disagree about the quality. The Matterport Camera handles light situations much better and has far better depth of field. The Tetha S is blurred while the Matterport 360 are still clear. I don't know how the 360 would be. As I have an iPhone and they only support Samsung phones. The images I have seen dont look crisp eitheR. I am not going to defend Matterport here, because it is not my business, but the truth is that all the factors that this person is using to justify his decision where there the very first day when he bought the camera. So, if you are not wise enough as to consider the pros and cons of entering into a new venture BEFORE you take the investment decision, then you will have to pay the price. Matterport has always been very direct with its value proposition. Before purchasing my camera I asked about everything. Not all the answers were the ones I wanted to hear, but in the end I compared pros and cons and here I am. Am I getting enough business with my Matterport? Well, not as much as I imagined, but the ROI beats a lot of other business alternatives. Now, if you think that you can make a living out of an investment of $ 6,500 (camera, tripod and iPad) then you are delusional. Matterport helps to complement a whole set of services that you must offer if you want to serve the real estate industry, the hospitality industry, etc. Will Matterport stand the test of time? Probably not. Other innovations will emerge in the coming months and maybe an open business model will replace the firmly closed Matterport system. But I don´t care. I will use my Matterport for as long as it is profitable and justifiable and will move on. We, as photographers and "owners" of the relationship with the end users, have the freedom to chose wich technology to use. Matterport shouldn´t forget that. @jfantin I agree that you need to research before you make a purchase. However the evolving nature of business,the change that the a business needs to make to stay competitive needs to be supported by Matterport. Not putting a ball chain on a business leg for no other reason than Matterport can not figure out how to monetize? We pay a monthly fee for the models that we create. We would have more models eg. Matterport would make more money. What am I missing here? It's like stubborn 3 year old. Matterport: "No I don't want To give you the shericals images" Me: "But I will pay you for it? I promise!" Matterport: "I don't want your money I much rather keep your images!" Really? @grmngrl I agree with you in a 100%. That's why I say that Matterport will not pass the test of time. Creating fences around your business model is the best way to be certain that you will fail, and this is what they are doing. But the debate was around the reasons why someone decided to sell his camera, blaming Matterport for not doing what Matterport wasn´t doing at the time he purchased his camera. - "dollhouse is not a value proposition for me because I shot business" !!!! What [...] was he thinking when he decided that Matterport was the right camera for him? I mean, everybody knows that Matterport is just a 360 virtual tour with a dollhouse. If dollhouse has no value, Matterport is not the right tool. Being obtuse, as Matterport is, is one thing, but purchasing something that you know, in advance, that is not for you is something different and it is not Matterport's fault, and this is my point. @grmngrl I've only seen images of the theta, not used it myself. I do used the gear 360 however and I imagine they are comparable. While matterport is great with the scanning side, the panoramic side is seriously lacking. For those who have been using the camera long enough (2013) you might remember the panoramic feature wasn't always there. Originally it was just the scan view (what you see in the workshop view when you use the measure tool) imagine that. Maybe because I also shoot high end panoramic shots is why I am critical of the matterport quality. Remember it's only a 2mp camera with any image processing done onboard/in software. @Jamie I have a Ricoh Theta S sitting in my camera bag. I shot 3 Apartment Clubhouses with it for Street View. One tour I shot with the default out-of-the-box settings; one tour I shot correctly with up-to-date firmware and with HDR turned on; and then the other tour I shot without HDR turned on. All three were unacceptable to my client. At this point, I was facing reshooting with traditional DSLR + panohead photography and I knew that Google Street View required more than my normal 12 panos with arrows between the doors. So what did I do? I took my research that I learned from 'MatterXport' and created a workflow for exporting and preparing Matterport panoramas for Google Street View. I was absolutely blown away by the excellent results. So much so that I started up a 3rd party conversion business! It took only a week before Matterport contacted me to inform me that I was violating their terms of service. They were friendly, but I was a bit sad that I couldn't offer this service to people. I even had made my website support the notion of purchasing Matterport cameras from them for Street View. Now, I know you already know this, but the point is - my Ricoh Theta S is sitting in my camera bag unused. I prefer the Matterport for 360s. I can shoot BOTH a Matterport tour with superior interface and automatic building of a tour with dollhouse -- and a Google Street View that was built using an app that visually allows me to scan in straight lines and plan the walkability of my tour like a pro. It might not be as fast, but there's a lot less running away and hiding from the camera. I have created many BEAUTIFUL 30+ megapixel panoramas in my life. I would create tour where I meticulously edited. This is why I'm very critical of many other platforms. I'm done though -- the editing process and work involved created something that was cool -- but lacked the immersive feel of Matterport. I was advertising my services as 'immersive' and yet I found Matterport -- with the lower quality panos -- to be the most immersive thing I've experienced. From depth of field being just right to the image quality as a whole being consistent enough -- I was sold. Matterport vs. DSLR panos? Matterport wins in my books because I'm scanning 10x the number of scenes and delivering tours for 40% less money to my client with 99% less post processing work. I find it very hard to believe that even 5% of Matterport owners want to export their panos, let alone know what to do with them. In offering Matterport to Street View conversion -- during the two weeks it was offered, I had few orders. I did have many interested parties who I've worked with in fulfilling orders they promised to clients. I noticed that downloading panos was not an option to vote for on the recent Matterport survey. I would actually find it very interesting to see some stats on what the broad userbase (beyond the forum) wanted. @Jamie I think that Theta S does well in homes - but for Apartment Clubhouses with large open windows there were all sorts of issues -- the large rooms were not very sharp and the windows caused lots of blowout that the HDR didn't do an amazing job at. My camera phone takes better images IMHO (Nexus 5X). ... to include more Members in the discussion of iris360 versus Matterport. 2- do you find that the image quality overcomes the lack of brand recognition vs Matterport? Excuse the sunlight in some pictures! It was a super bright day with no blinds in the apartment. 2. Yes I think it does. They are 2 different systems filling a similar need. For real estate I feel it's superior because it's faster, image quality is far better and a floor.plan is included. It's a perfect system for most applications. The transitions between panos is not as smooth as MP however and some clients (usually mp xlients) don't like this. This brings back this question. If it wasn't for Matterport's "dog' house and transitions, how would a Matterport Showcase model differ from a Street View scene? Here's an old forum where KRpano folks praise Matterport's "transition effect between panos." They're trying to figure out if they could do that using KRpano. I've been playing with transitions for a while. There's a transition effect on a KRpano demo page that is fairly impressive; they call it a ZoomBlend transition, one of many available transitions. ZoomBlend simulates what you might see when you move "into" a Matterport Showcase model. It looks like the KRpano transition software is zooming and fading the starting pano, pano A, while at the same time bringing the target pano, pano B into view. I think they could improve that transition by making pano B fade in instead of showing it abruptly as pano A zooms and fades OUT slowly. Since KRpano has custom transition settings, maybe KRpano users could tweak the zoomblend effect to make it more realistic. 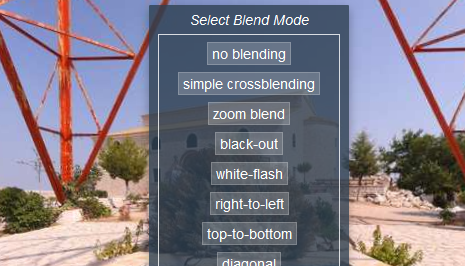 View the demo by clicking the "zoom blend" button located on the "Select Blend Mode" menu. Many transition types exist. In their demo, you transition from location to an entirely different location. In practice, we'd want to transition between two points in the same room or a point that's visible in the room. Making that work convincingly would require positioning your panos correctly and aligning your navigation circles. Matterport's already figured this out,it's not impossible for someone else to create software that links panos quickly. The Matterport dollhouse is another crowd pleaser. But what if some users would be satisified working with a regular 2D floor plan if a business or home wasn't large? Additionally, in real life, I'm not sure how many people visit a home with a realtor and ask to see the floor plan. And, because they're only human, they have to navigate through a home the old fashioned way; they have to walk. They can't click something and teleport to the third floor bedroom. So, if wanted to roll my own low-featured Matterport,I might get a quality 360 camera and create a "Street View"-like tour that had a 2D floor plan, useful for navigation, and transitions similar to the ZoomBlend. Lots of blue circle/navigation points are nice, but I've also wondered if one or two shots from near a room's center might be enough if I'm targeted budget-minded Kmart shoppers who want to create home virtual tours on a budget. Finally, I'm a pretty good photographer and image quality is important, especially in print and on the Web. However, as a hobbyist, I've been surprisingly happy shooting 360 panos on my Note 5 using the Google Cardboard Camera app. You spin around holding the camera the way a Matterport camera spins around on its tripod. Image quaity is "ok," but for me, immersion often trumps image quality -- especially in a VR headset, which by its very nature, does not display the highest quality images. That should improve as cell phone display quality improves. Cardboard panos don't even display everything above or below you but again, in VR, the immersion effect itself may be enough to wow a crowd. Megapixel count may come in a distant second or third. I'd still like a Matterport camera. The transitions are unbeatable, especially when you click a different floor in the "dog"house and rise magically through the ceiling. I'm not sure if Lenova's new Tango Phablet can compete with a Matterport camera's scanner, but the day will probably come when consumers can shoot their own low-budget low-quality room scans using a cell phone. They'll then need a service like Matterport to process all those point clouds. Oh, I think the quality from that is great! For under $2,000, that's comparable to buying a DSLR, Fisheye Lens, Tripod and Panohead. I love it! Here's a link to a GSV source from a "camera" that a lot of people on this forum seem to own that I shot yesterday. I think the sharpness is a bit better ... but I don't know why as the IRIS shoots larger panos... your thoughts? So I think that for someone without an IRIS who wants to only do 1 scan, it would be nice if Matterport would allow me to market my services as a 3rd party business. Again, I keep looking at your Street View -- it's great! @Metroplex360 wonderful quality. Love it! And yes they should! Thanks for sharing. @UserName that is great! Love the different transition options. I would know the difference, I don't think the average user would. Not 100% sure but I think you could add music to the kolor tour which is a definite plus.